A Landscape photographer living in Connecticut, USA. 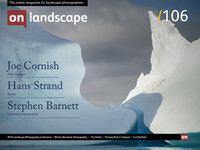 I’ve been involved in landscape photography for over 20 years - originally 5x4, then MF and now digital. Although I continue to travel for photography, particularly to the desert southwest, I am now retired and have more time to explore locally and develop my craft. I am not obsessed by photography, and if anyone tells you that they must be part of my immediate family, and you need to realise they have baggage. I live in Melbourne Australia, enjoy altered and natural landscape photography. I also have a day job, and that proves I don't spend all my time taking, editing and printing images. Our 4x4 feature is a set of four mini portfolios from our subscribers, each consisting of four images related in some way. If you would like to submit your own 4x4 portfolio please visit this page for submission information. Please click the images to view them full size. The day I took these photos I had set out with the intention of photographing autumn leaves only to find that the light wasn't suitable for capturing their full glory. I then noticed that some leaves from previous years had been trapped in branches as they fell to ground and decided to make the small series of photos shown here. My habit has been to periodically spend a week or two immersed in photography at some distant location, usually one of America’s national parks. Originally, I was looking to capture “the shot” at an iconic location. I still enjoy working this way, but now I concentrate on searching out less grand images along the way. I’m also working on groups of images around specific themes. Spending more time exploring locally, in western Connecticut and Massachusetts, gives me the opportunity to expand a theme over a period of time. The images in this set are the start of a portfolio on how nature creates order from chaos downstream from a waterfall. The main ingredients are a high vantage point and patience. Over time the random movements of turbulent water organize into their own compositions. I find that my projects often come about in a serendipitous way - this one was no exception. I started photographing a piece of Barley found in my back garden and began by shooting the grass against natural floral backgrounds found in the same garden. This led to experimenting with Multiple Exposure techniques and also combining these further in Photoshop as my camera is limited to 2 exposures in ME mode. I'm always interested in exploring my local area and have found that other than specific photo trips with friends, a vast proportion of my images are shot within my locality of Enfield and Hertfordshire. While these aren't glamorous honeypot locations, there is a lot of green space, woods and the whole of the Lea Valley to explore. Ideally these colour studies are the beginnings of working towards a Fellowship of the Royal Photographic Society. The first few days of October this year saw the lowest tides of the year in Broome. In the far north of Western Australia, Roebuck Bay has a tidal range of 9 meters (that's vertical). Nigel Gaunt, close friend and photography mentor, was closing his gallery and heading south, and that seemed like a good excuse for a photographic adventure. The most popular circuit for aerial shooting near Broome is north-west to Willy Creek, returning in time to photograph the Cable Beach camel rides near sunset. We asked the pilot of our R44 to head east to Sandy Point. Nigel had noticed a shift in the sandbars, exposing more of the uncharacteristic black sands at the top of the bay. Late dry season burns north of Broome meant more hazy than was ideal, but for a good deal of the 90 minute flight it also cast an eerie light. This landscape changes fast. The run out from the peak tide creates trenches of rushing water that are wider and deeper than the Thames. Low islands emerge and a few minutes later they are promontories and then absorbed in the rising beach. On this flight the wind was up, so we had the benefit if added textures as northerly gusts scraped the water. It was not a comfortable shoot. A touch over 40 degrees celsius and no doors, so at the end of the ride it felt like an hour in front of a blow dryer. But the patterns were magic, so nobody was complaining. My four favourite images from this trip were all shot with a Canon 5DS-R and 24-70mm zoom. What I enjoy most is partial abstraction of the landscape: at first you think the image is soft, they you spot an edge or a pelican and realise its the wash of the water, and at the same time the scale of the landscape is revealed. Of course, these are also temporary landscapes. Within 11 hours a fresh tide has erased the run out rivers and carved new canals. I guess that's a good excuse to return for more.